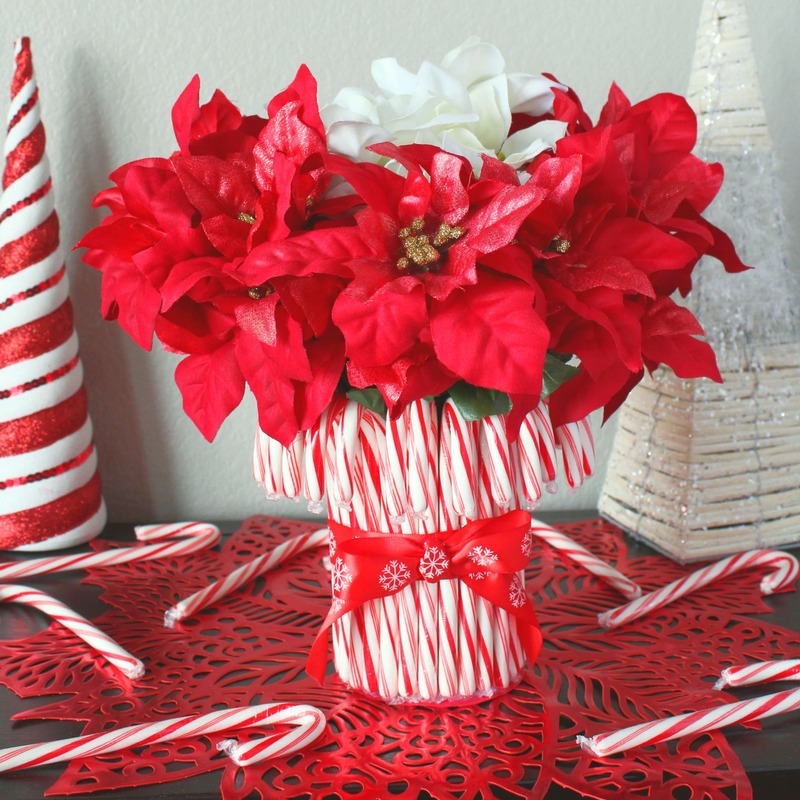 For our Christmas party some years ago, I bought several Christmasy flower arrangements, carefully arranged them in vases, and placed them around the house. Classy, perhaps, but completely unimaginative. I’m pretty sure no one even noticed them. Not exactly money well spent. Want to have less stress and more joy this holiday season? It’s easy with our free Holiday Planner. Find out more by opting-in below to have our Holiday Planner sent straight to your inbox! 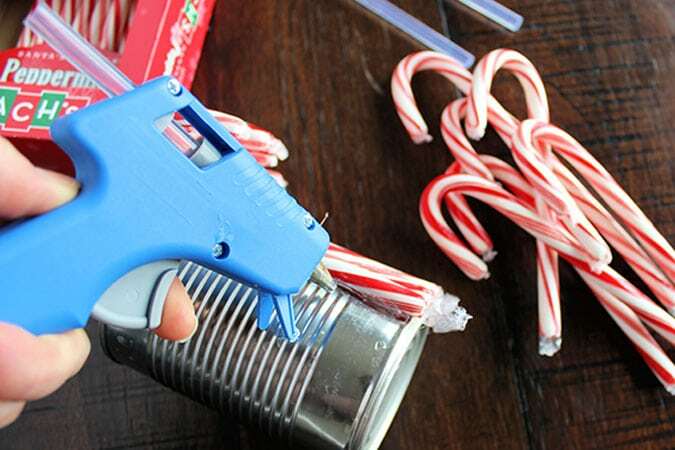 Step 1: Hot glue the candy canes around the can. 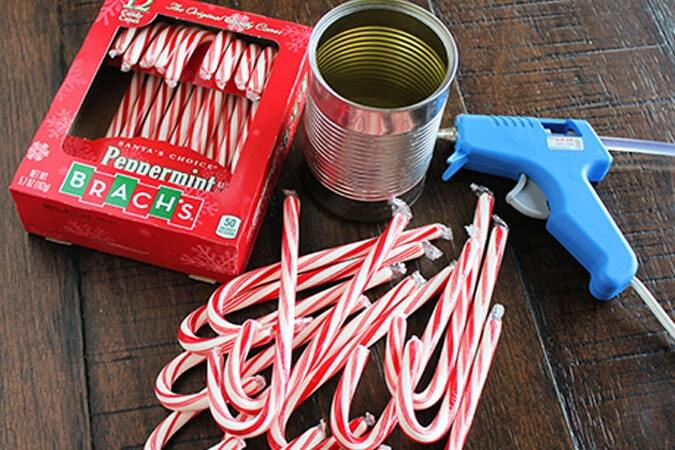 Step 2: Continue to glue candy canes around the can until completely covered. Step 3: The wrappers hung down over the bottom, so I glued those down and then cut a circle of scrapbook paper & glued that over the wrappers. 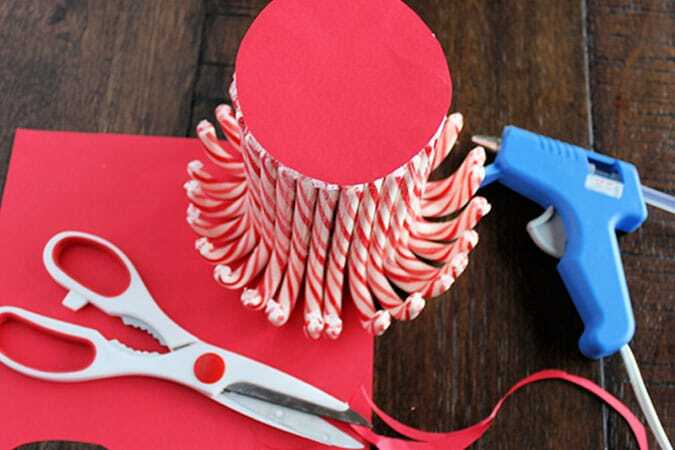 Step 4: I found a matching piece of scrap ribbon to tie around the candy canes & glued it in place. Step 5: I glued a matching bow on the front of the ribbon. I love it too! That is awesome! Very cute and thrifty! It is my goal in life to one day be the kind of woman/mom who crafts her own stylish home decor. Until then, I'll just enjoy the reading about how other people do it. Love!!! Love it. 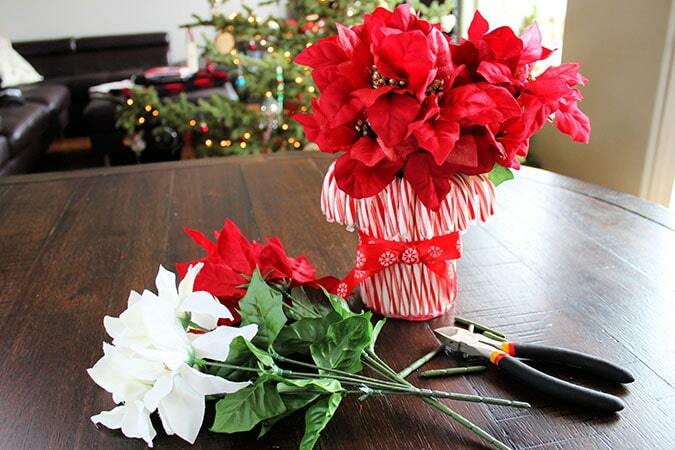 Cute and thrifty, great idea. Must try.. 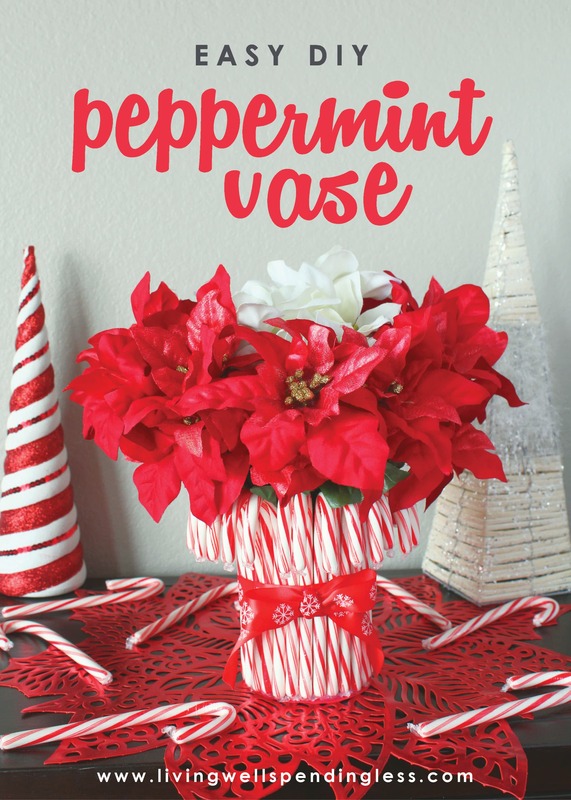 This looks so lovely and it seems so easy to make. I know my daughter would love helping me make a few of these to place around the house. Thanks for sharing! I love it hopefully we can make some for Veterans this year for Christmas i need to know what size can did you use so i can get our group to start saving them. 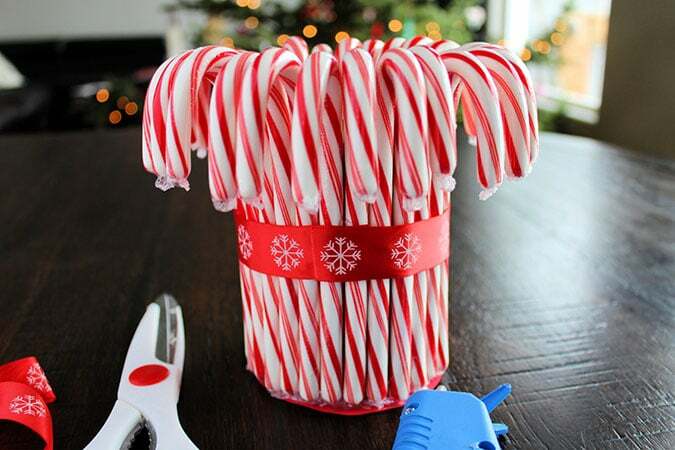 How many candy canes per can? 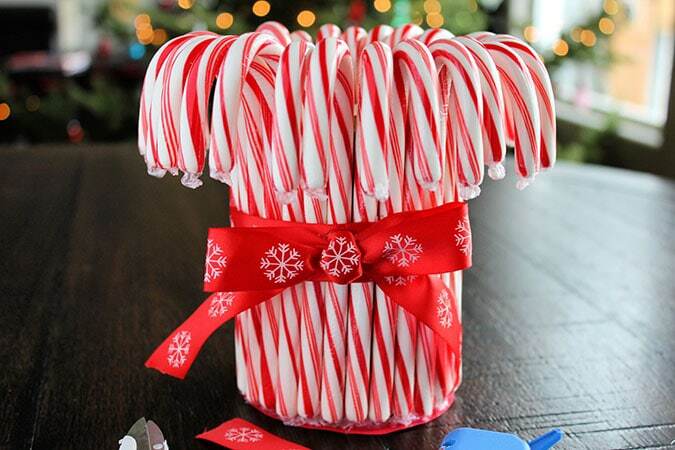 I was thinking for a temporary vase you could get a wide mouth glass or jar and put the candy canes inside with the hook part going over the side. 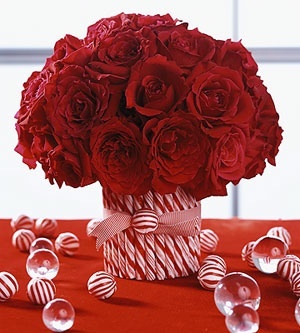 Just put your flowers in the middle and it would look very Christmassy. 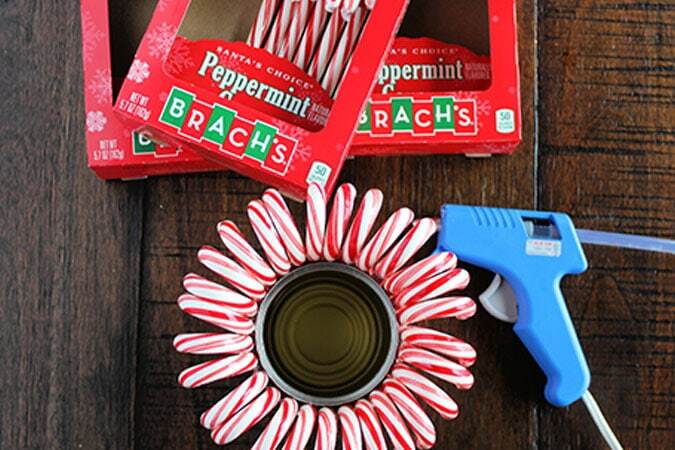 You could even eat the canes from the back or after Christmas!